I finished these the same weekend as Stasis, but they are impossible to photograph! This colour (Espadrilles, by Madelinetosh) is definitely not what I usually go for, but it’s fun and bright and very well suited to this pattern — Betula Socks, by Rachel Coopey, whose designs are so reliably excellent and fun I will happily continue to knit them up as long as she continues to publish them. These were on my needles for a while. I cast on before going to California, knit them on the plane there and during our time in San Francisco, before putting them down to finish my Skyp socks. 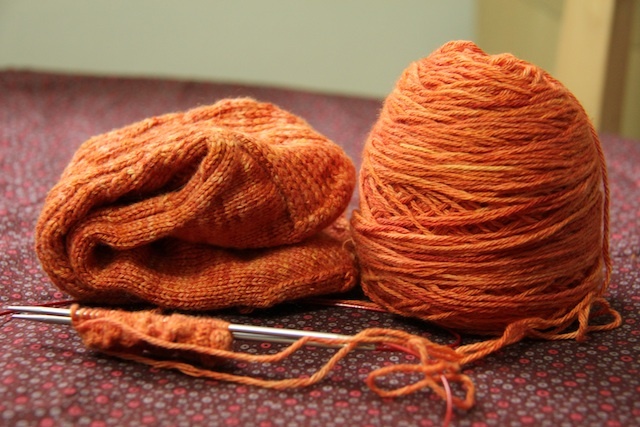 I blame the lag for the reason they are not quite the same size: Despite knitting them with the same skein of yarn on the same pair of needles, one sock is slightly larger than the other, in both length and width. Maybe I knit one while relaxed and another while tense? Who knows. The difference isn’t enough to really bother me, but it is a little funny. Notes: I tend to choose my size based on the number of stitches cast-on. With these socks, though, the majority of the rounds actually have additional stitches (because of the stitch pattern), so they fit a little big. If I were to knit them again, I would probably go down a size. I’d also be tempted to mirror the charts across the socks, but it’s kind of fun that they’re designed to be matching-yet-fraternal. Ravelled here. It’s mid-October, so I thought a Soctober update was in order. Mostly, I think, I’m on track. My first priority this month was to finish these Stepping-Stones socks for my mom, and I’m only a couple of inches from starting the toe decreases, so if all goes well they’ll be in the mail by the end of the week. Indigodragonfly Superwash DK in Fringe Over Troubled Water. I changed skeins part way through the foot of the first sock, so I’m interested to see if the difference between socks is noticeable. 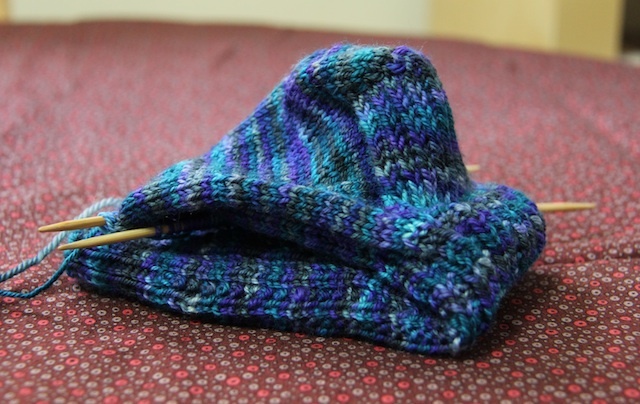 If you’ve never knit socks or are looking for a speedy pair, I can’t recommend Clara Hughes Parkes’ pattern highly enough (I can never get the name right on first type – this is why). These socks knit up quickly, are more than just plain stockinette but don’t require too much attention, and are a free pattern to boot. This is the second time I’ve knit these socks and I know more pairs are in my future because, honestly, in Canada we need thick socks. I also plan to knit the large size in lighter-weight sock yarn, because I like the way it breaks up the colours in variegated yarns. Second on my list is Saltburn. These are the official start of my Christmas knitting, so I can’t say too much about them. I will say, though, that I’m planning to shorten them. The recipient like ankle socks, and while those aren’t super practical in the winter, I don’t want to knit socks so high that they won’t become part of the regular rotation. To compromise, I’m knitting the cuff as written and then three (rather than five) chart repeats. The leg is 3.5 inches right now, which is probably as high as they need to be, so when I pick these up again I’ll be dividing for the heel! The white is Tanis Fiber Arts Blue Label in Natural and the blue is Jill Draper Makes Stuff Splendor Sock in Cobalt. That makes these socks just about 1/4 finished, which is a nice surprise. I usually knit the legs of socks to somewhere between 5 and 7 inches, and only knitting to 3.5 makes these ones feel super speedy! I’ve been trying not to get ahead of myself planning- and execution-wise, which is something I absolutely tend to do, especially ahead of the holidays. I’ll cast on four things and then wonder why I’m not seeing any progress. This year, I’m trying a more measured approach and working on no more than two projects at once: one that requires attention and one that’s more mindless. Saltburn is my current attention-requiring project, but since I’m almost finished my mindless Stepping-Stones, I decided it was time to wind the yarn for the next mindless knit. 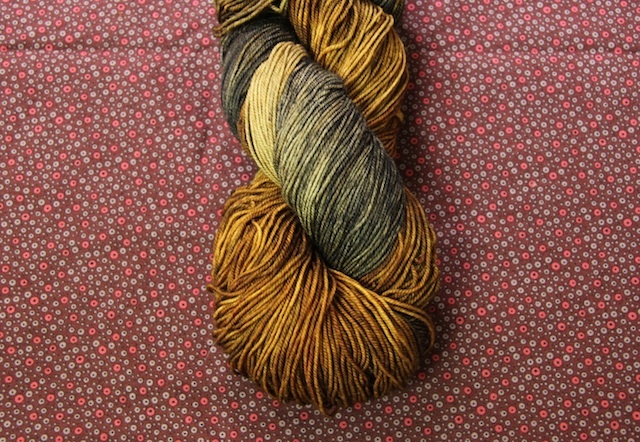 Dragonfly Fibers Djinni Sock in Mushroom Hunting. I can’t get enough of this colourway. 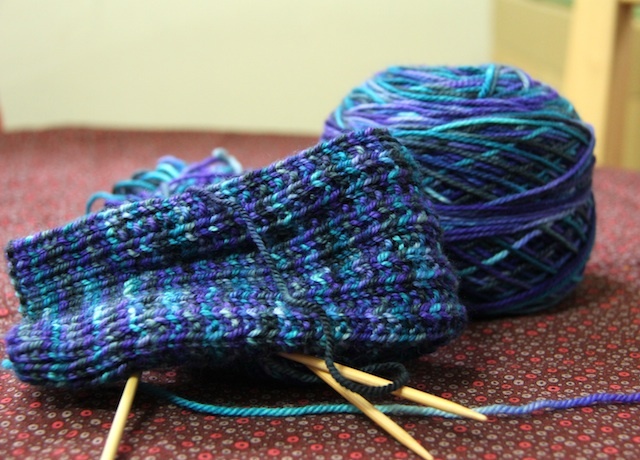 I haven’t yet decided on a pattern for L’s socks, but I’m thinking they’ll be something kind of plain. The yarn is gorgeous all by itself, and he’s not sure he wants anything fancy, so I’m going to keep it simple: 72 stitches knit up as… well yeah. I have three basic options, I think: a) 1×1 ribbed cuff into 3×1 ribbed sock; b) 1×1 ribbed cuff into 1×1 mistake rib (one row 1×1, one row knit); c) 1×1 rib cuff and stockinette. What do you think? Do you knit man socks? What gets the best reviews? 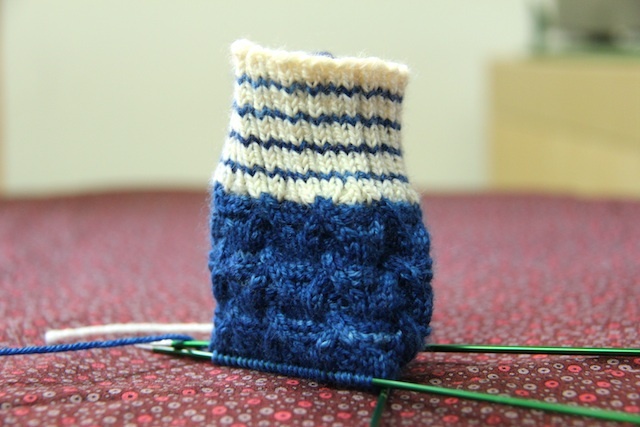 I’ve knit lots of socks, but never for L, so I want to try and get this right. Can you believe it’s October 1? That seems crazy to me, but since I can’t do anything about it, I’m going to go with it. Bring on Socktober, this year, I’m ready. Besides some finishing up, this month is going to be all socks, all the time. I’m not great at monogamous knitting, so I’ll have a few pairs on the go at a time, with the goal of knitting two complete pairs and finishing at least one other. That may be insane, but we’ll see how it goes. My first plan is to finish up these Stepping-Stones for my mom. I cast them on in April, knit three inches and then put them down for six months. It’s starting to get cold again, though, so it’s time to finish them up. I picked them up the other day to stash in my bag as after-work knitting and I’m almost done the gusset decreases on the first sock. I’m knitting them in DK-weight yarn, which is coming out looser than the other pair I knit, so maybe they’ll end up being layering socks. Either way, they’ll keep her feet warm. My other plans are holiday-related, so I have to keep things a little vague. 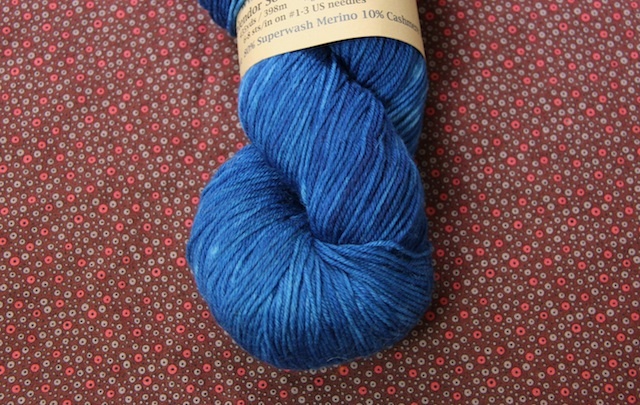 I’m planning to knit Saltburns for my sister, using this delicious bright-blue. 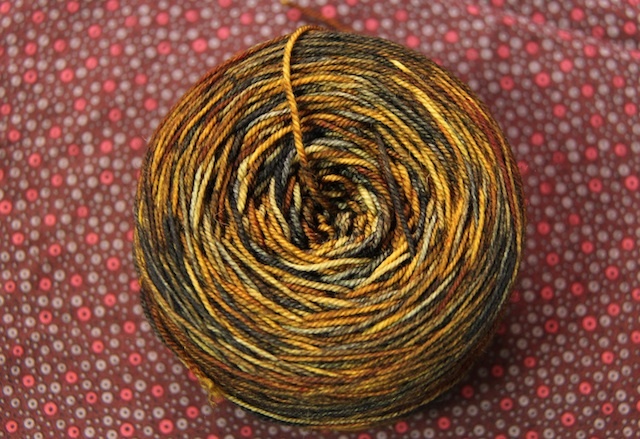 And, for L (who has finally come around to hand knit socks) I’m going to knit a simple 3×1 rib in this warm brown. I figure I’ll go basic for the first pair, and if he likes and wears them, I’ll knit something more fun. If by some miracle I get all of this finished (or, if I finish the first two and then need something interesting to balance out the ribbing) I’ve got my second pair of Daphnes to finish up. I love these socks – the colour is perfect, the pattern is fun, and the only reason I put them down was because I needed something more mindless to balance out Burrard. 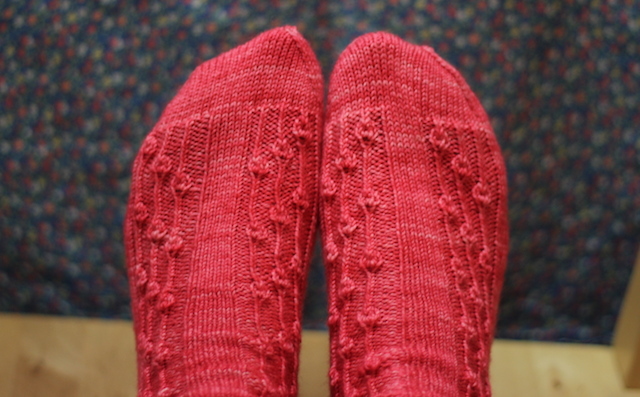 They’re more of a summer sock, but if I finish them now they’ll be ready and waiting next year, which is okay by me. Are you knitting socks this month? Please tell me you have crazy Socktober plans so I feel less like a maniac.